The key at the end of the cable is inserted into the cartridge end after warming the nose of the cartridge. The flag can then be attached to the side of the locomotive by its magnetic base to provide an external indication that the GURU® has been disabled. When the locomotive’s cooling system is back up to temperature, the key is easily removed and the GURU® is again armed to protect the locomotive. The GURU® Flag and Key allows refilling a locomotive cooling system with cold water that would otherwise trip the GURU® Plug open. 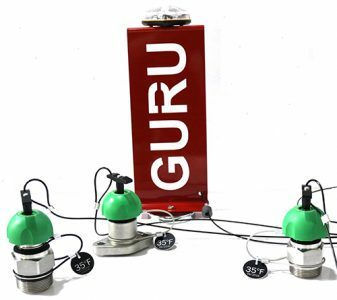 The GURU® Flag is a highly visible indicator that the key is inserted and the GURU® Plug is deactivated. This will help to prevent leaving the key in the valve resetting stem, defeating the valve’s function and possibly resulting in freeze damage to the locomotive.